Holly, can you speak about your background before yoga? I grew up in Juneau, Alaska. I was always athletic and played volleyball when I got to high school. In my sophomore year I began having problems with my shoulder, it would subluxate (partially dislocate) sometimes when I hit the ball. It was a hereditary problem as my brother had the same thing; my doctor only spoke science so it was hard for me to understand what was wrong. The gist was that I have stretchy ligaments that were too loose to keep my shoulder in place during the overhead motion of hitting a volleyball. He also said I was probably more flexible than my classmates (years later a physiotherapy friend would tell me I have hypermobility syndrome). I never noticed. The shoulder subluxation began happening more and more frequently despite me doing regular physical therapy. I had surgery my sophomore year of high school at age sixteen; afterwards I went through more physical therapy and got back into volleyball. This time I blew out my shoulder in the middle of a game. I had a second surgery during the summer between my junior and senior years of high school at age seventeen. No more volleyball. The doctor said I would always need to keep my shoulder strong in order to keep the joints in place, so I became very dedicated to lifting weights. In college I joined the crew team. It was a brilliant way for me to participate in a sport and keep my shoulder strong. I rowed all four years. Before practice we would always warm up and “stretch” before going out onto the water. I say “stretch” because it was 5am and I mostly fake-stretched while yawning. After college I started running, and going to a gym to lift weights for my shoulder health. After a couple years my knees started bothering me and I was getting tired of going to the gym. I started getting this feeling like I wanted to try a yoga class. I was still terrible at stretching and knew I should make more of an effort. I was living in Tacoma, Washington (the city where I went to college) and noticed a sign for yoga on a street near where I lived. I called the number to request a brochure, and attended my first class shortly thereafter. It was in the house of a yoga-teaching couple, that just so happened to be certified Ashtanga teachers David and Catherine Garrigues. That was in 2001. I started going once a week. What was your initial impression of the practice? I loved it, it quickly became my favorite time of the week. It challenged my strength and my balance as well as my flexibility. I had to overcome fear of putting my body in these new and crazy positions. I soon bought an Ashtanga book so I could do the practice at home. Of course it helped that David and Catherine let their cat wander around during class (I loved that). It was around that time that I decided to work on applying for graduate school. I had studied art in undergrad and wanted to go for an MFA in painting. I audited a painting class at my alma mater to help me prepare more work for a portfolio submission. I remember my weekly class was on Monday nights, and after I would go to campus and paint for a few hours. I would have these amazingly meditative and productive painting sessions. The practice helped me realize that the process of making art was, for me, a meditative experience. This later became the basis of my graduate thesis. You became a new mother recently. Did the practice prepare you for motherhood? How? I would say in some ways my experience with practice prepared me for motherhood, but I would also say pregnancy and motherhood have brought forth yoga’s importance beyond asana. During my first trip to Mysore, I took a Sanskrit and Philosophy class in the shala with Laksmish, who now teaches the shala’s mandatory chanting. The biggest lesson I took away from that class was this: happy people have no expectations. I think about this idea all the time, and never has it rang more true than it does during seventh series. Knowing this does not make me immune to having expectations in life and I certainly had them in the last two-ish years, but with this lesson in mind I can at least say I was not blindsided when those expectations were not met. For example, my husband and I chose a birth center when I got pregnant, because I did not want to give birth in a hospital. I wanted a natural birth in a beautiful setting with candles, a tub, and no drugs or intervention. What I ended up with was an induced hospital birth due to mild pre-eclampsia, and an epidural. Then, I wanted to breastfeed exclusively and for as long as my son wanted. 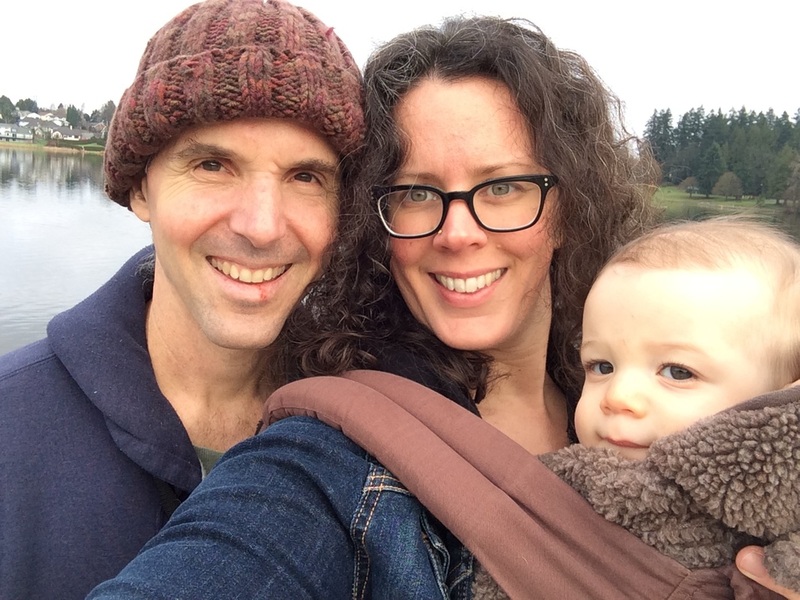 I ended up having to supplement with formula from eight weeks until I chose to wean him at eleven and a half months, because I had a low milk supply and I got tired of revolving my days around milk-boosting foods, supplements, and 3:30 am pumping sessions. Nothing in my birth or post-birth “plans” turned out the way I had envisioned, but I am beyond grateful for such a perfect little boy. He’s happy, and therefore I’m happy. As each obstacle came up in this process, as each expectation I had was not met, I did my best to accept it and move forward. Something else that comes to mind is aparigraha, non-attachment. In the days of long Mysore stays I thought of non-attachment as not being attached to my spot during the madness of Friday led primary. But with pregnancy non-attachment began referring to asanas. Transitions. Comfort. Postpartum, non-attachment referred to sleep. Showers. Bandhas. In those early days, I could barely put my son down. I was desperate to do some kind of practice, even if it was a few gentle sun salutations. But he would only tolerate not being held for twenty minutes at a time, on a good day. Not such a big deal in the beginning, but as I began adding postures back I had to only do what I could manage in twenty minutes. I would get through standing, and then several hours later I might be able to pick up and get to janu sirsasana a. A few more hours would pass and I might do finishing. Many days I would “finish” my practice at 4pm, even though I started it at 9 am, and I wasn’t even doing half primary. My son is now thirteen months old as I write this, and it has definitely gotten easier with time. But seventh series, especially the first year, is no joke. Recently in Mysore, Kino was given the first posture of fifth series. That is amazing. What’s also amazing is taking my heels in kapotasana every morning, only to spend the rest of my day carrying a 22 pound wriggle monkey up and down the stairs without my back falling apart. What’s amazing is my friend who works all day and practices during her lunch hour so she can make the most of her time at home with her daughter. What’s amazing is the new mama who continues to practice without vinyasas because her healthy, heavy baby is wreaking havoc on her wrists. Parents should and do receive extra credit in this practice. Sharath likes to say, “Asana is two hours, yoga is all day”. Parents, specifically new parents, don’t have the luxury of two hours; we do what we can on the mat, be it twenty minutes or ninety, and we let go of the rest. Seventh series is all day. Can you share with us your experience of visiting India and practicing at KPJAYI? 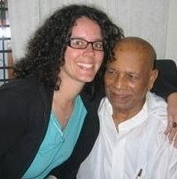 I made my first trip to Mysore in the fall of 2005, when Guruji was already 90 years old. He was still teaching in the shala, running around to help everyone with backbends, with Saraswati and Sharath assisting him (though Sharath was the not-so-secret boss). For whatever reason, Guruji took a special liking to me, and he was always at my mat during backbends even though Sharath stopped me at supta kurmasana and I shouldn’t have been pulled to standing. It was a special time. There was a guesthouse/breakfast cafe in Gokulam run by Kevin Kimple at the time, “The Kev Inn”, originally known as Holly & Tony’s. A month or two into my six month stay some other girls and I found out Kevin was looking to sell, and we started joking about taking it over and calling it “Shakti”. Those girls and I, Satu Rommi and Trisha Rossi, found ourselves doing just that a few months later. 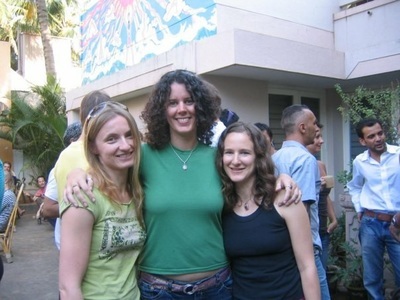 We ran the guesthouse for two years, with Satu basically staying year-round and Trisha and I switching off seasons. I stayed October to April for three consecutive winters until we managed to sell it off to become its next manifestation as Alia’s Om Cafe. Folks who go to Mysore now know it as Anokhi Garden. Last time I was there, Holly’s hummus sandwich was still on the menu, which is funny because hummus was Trisha’s idea (though I made it). So there we were, running a business catering to other yoga students while practicing ourselves. It was such a unique view of yoga life in Mysore. We loved yoga students and we hated yoga students. Yoga students can be extremely high maintenance. They wanted us to fix them food that conformed to their vegan/raw/whatever standards, completely ignoring the fact that some of those things are not appropriate in India. They didn’t understand why we wouldn’t take in every puppy they came across on the street, even though we were already the caretakers of three shala dogs. More than once we ran out of gas for our stove in the kitchen and we had to serve nothing but fruit salad and toast, because gas was rationed and we had used our monthly quota, and our source couldn’t secure us any on the black market right away. We were managing an Indian staff of five. Sharath referred to us as the “Powerpuff Girls”. Of course the insanity we endured was worth it because it meant such long stays in the shala. We practiced with Guruji in his high-speed led primary, and we watched Guruji’s health decline until he stopped teaching in the shala and Sharath stepped into his current role. Bittersweet. When we sold the business in 2008, we celebrated big time. Satu wrote a book about our experience, but it’s published in Finnish so Trisha and I will never read it unless she translates it for us (she won’t). All three of us managed to be there at the same time in 2012 for a brief overlap and it was the best ever. I’ve made it three more times since selling the guesthouse. Each trip I’ve savored the magic of practice as much as possible, and then made breakfast at home, or ate at a local Indian place, away from the yoga cafes. I still go occasionally but the experience of running our cafe soured my taste for intensely social Mysore mornings. My trips have slowed down, and will no doubt continue at a snail’s pace thanks to seventh series and building a life at home. For the Shakti years, I wandered. All of my stuff was in storage so I could be a gypsy. I would winter in India, travel a bit when the shala closed, stop for a few weeks in Europe, and then go to my Alaskan hometown to work for the summer and mooch off my parents. The money I saved would help cover the costs of my next trip that the guesthouse couldn’t. The next trip I make (I am hopeful it will be in 2016) I will be towing a little toddler along. Mysore will be even more modern than before. The experience will be different but the magic in the shala never changes. I miss it! If you could go back in time, to the “I just began Ashtanga” Holly, what would you tell her about the practice and yoga path? I don’t think I would tell her anything. I reflect on my path fondly and have enjoyed the ups and downs of the process of discovery. How would you describe your teaching style? How do you recreate the magic from the shala in Mysore? As a teacher, I’m doing my best to create a welcome and supportive space in which my students can flourish. I think Tim Miller often says that he is not the real teacher; the practice is the real teacher. That is how I feel. I want to help them navigate their way through the practice with enough room for them to experience it as fully as possible. I also want them to feel like they can giggle. I’m so lucky because, in the small amount of time that I’ve lived and taught in this little town, I’ve acquired some wonderful students. So far they are all new to the practice and they are experiencing the process as beginners to this method of learning. It’s exciting and inspiring to observe. Is the magic there? To a small degree, yes. My home shala space maxes out at six students, and when that little room is full I definitely feel the magic. But the magic is not me, it’s them. You have changed from living as a “gypsy” to a householder. How has that informed your practice? At this point I feel like I can take my practice anywhere. I love that I’m settled into a householder’s life, with my sweet family and a house with a room dedicated to yoga. Life isn’t always so friendly to practice and my travels have shown me that I can persevere. I’ve practiced on a boat in the Galapagos Islands and I’ve practiced in hideous hotel hallways. A beautiful studio, a Manduka yoga mat, and $100 yoga pants do not make a practice. We all make our own practice with intention, devotion, and surrender. Glamour is not required. Ashtanga tends to gravitate towards a certain type of person: possibly regimented and very focused. I sense that becoming a mother and combined with the experience of a deep and long-term practice has opened you and your heart up in ways unfathomable just a few short years ago. A sense of softening, if you will. Is this correct and how do folks without kids experience a touch of this? I think so, I feel like I’ve experienced a softening. As practitioners, I think it’s safe to say that most if not all of us go through a period where we are overly focused on the physical element of practice. We get caught up in asana; we rearrange our lives to make our mat the priority. We may even sacrifice jobs, relationships, and having a place to call home to make it happen. There was a time when all of my friends from high school and college were career driven, married, and/or having children, while I was working a temporary job to save up money for my next trip to Mysore. With seventh series, your priorities shift because they have to. Suddenly you have this little human relying on you for everything, completely and overwhelmingly dependent. That attachment to the mat has to soften for his or her sake. And we have to treat ourselves with kindness when we can’t make it to the mat for awhile, or to the same capacity as before. From there we recognize and perhaps (hopefully!) even embrace that yoga is more than just asana. I can’t say with certainty or authority that those without children will experience this same realization and softening, but I think that if we stay with this practice long enough it will happen. If it’s not childbirth it could be an injury, a traumatic event or experience, or simply aging. Something in our body, whether internal or external, forces us to slow down and our only choice is to oblige. We may not realize it as it happens, but it is a gift.